Work in Bolivia and Peru seeks to transform agricultural research by focusing on changes from the household to the global levels. Andean Altiplano (Bolivia and Peru). 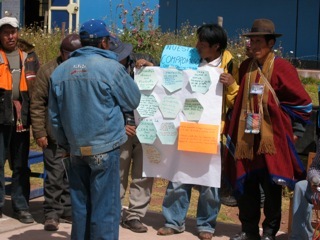 Partners in this region call this project the ‘Andean Altiplano Programme on Food Sovereignty’. Bolivian partners in particular make the link between agricultural research and food sovereignty. This is largely because the Bolivian government has made ‘food sovereignty’ the center piece of its national policy on food and agriculture. Level I. The field, the household, the storage room – the community level but also reaching networks of those who nurture food and agricultural fields. Methodological menu: Acompañamiento, Participatory Action Research processes and tools, Community and Participatory Video, Gender inclusive workshops. Level IV. The global scene of researchers, politicians and activists in favour of food sovereignty and alternatives to development. Methodological menu: alliances, social movements, policy and media dialogues.